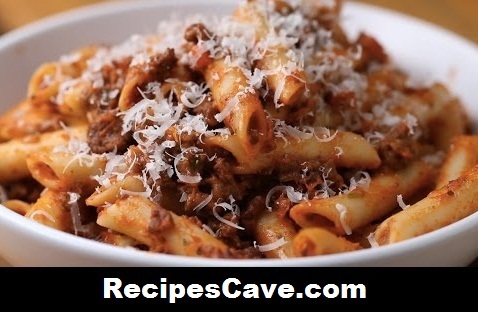 Creamy Sausage Bolognese Recipe - Here is what you'll need to cook follow this simple steps to make. 1. In a large pot, set on medium heat, add the olive oil and sauté the onions, celery, carrots, and garlic until they are soft, about 10-15 minutes. 2. Add garlic and cook for an additional 2-3 minutes. 3. Add the ground beef and the sausages. Season with salt and pepper, and break up the meat with a spoon and frying until no longer pink. 4. Next, add the tomato paste, Italian seasoning, and red wine. Stir and reduce until the wine has almost completely evaporated. 5. Now add all the remaining ingredients, except the parmesan and cream. Stir to ensure everything is well mixed. 6. Simmer for 30 minutes to 3 hours. The longer the simmer, the deeper and more concentrated the flavor. 7. Stir in the parmesan and cream to the sausage bolognese. 8. Add the cooked pasta to the sauce. 9. Serve with more parmesan, if desired. your Creamy Sausage Bolognese Recipe is ready to taste.